Northern Michigan’s tourism industry is getting a boost from American Airlines and Delta Airlines this summer as both operators will offer direct flights from Dallas Ft. Worth and Atlanta, respectively, to Cherry Capital Airport (TVC) in Traverse City. Over the last three decades, as Michigan’s economy has ebbed and flowed, many Michiganders moved to southern states seeking employment. The summer service from Dallas Ft. Worth (DFW) to Traverse City will add approximately 12,000 seats for travelers to the Traverse City area. The direct flight will depart DFW at 10:50 a.m. and arrive at TVC at 2:40 p.m., and the aircraft will return to DFW from TVC each day at 3:35 p.m. and arrive at DFW at 5:30 p.m. Envoy Air will operate service between DFW and TVC with ERJ-175 aircraft equipped with Wi-Fi. Delta Airlines, which began direct flights from Atlanta (ATL) last summer, is scheduled to begin direct flight service to Traverse City in June. In addition, daily service between New York/Newark and Traverse City starts this summer, and American Airlines will offer direct service to TVC from its hub in Chicago (ORD). The new services are being supported through the Small Community Air Service Development Program by the U.S. Department of Transportation. The grant is valued at $750,000 from the USDOT, and $305,000 from community partners. 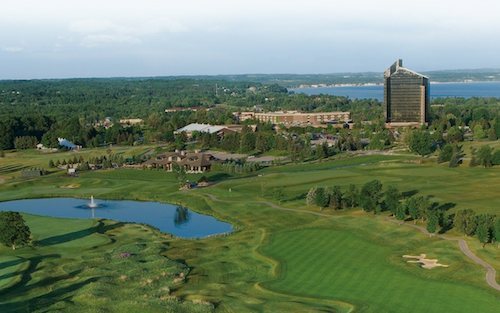 Tim Norman, general manager at Grand Traverse Resort and Spa in Acme, which also owns and operates Turtle Creek Casino and Hotel in Williamsburg, says the region has invested millions of dollars in recent years to attract more tourists. Attractions include day trips to Sleeping Bear Dunes National Lakeshore, award-winning golf courses, sandy beaches, several dozen wineries, inland lakes, shopping and festivals, along with numerous shopping districts. The resort, set on 900 acres, offers 86,500 square feet of meeting space, Spa Grand Traverse with 23 treatment rooms and areas, nearly 600 guest rooms and condominiums, shopping, a licensed day care center, as well as three championship golf courses including the Jack Nicklaus-designed The Bear, The Wolverine by Gary Player, and Spruce Run by William Newcomb.